What Are The 3 Most Common Causes Of Tooth Pain in Our Asheville Dental Office? Picture this: You’re all ready to go to your best friend’s big birthday bash. You take a sip of ice water while you’re getting ready. Only instead of quenching your thirst, the cold beverage makes your tooth feel like it’s going to explode with pain. Maybe you’re talking on the phone and letting people know what time you plan to arrive when all of a sudden it hurts even to open your mouth. It sounds like tooth pain or a toothache, and we understand that it’s definitely inconvenient when it happens to you – no matter the time or place. Your Asheville dentist generally describes tooth pain as any discomfort, aching, or soreness in and around your tooth or teeth. You may experience heightened sensitivity to cold or hot temperatures, painful chewing, throbbing, sharp pain, or a lingering dull aching feeling. 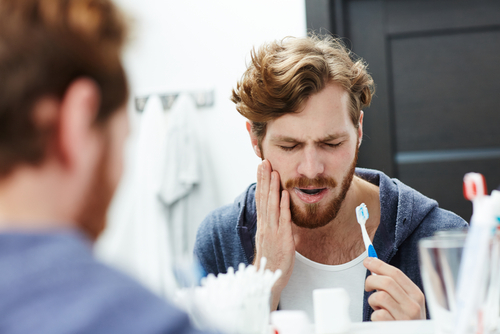 We are here to tell you that if you’re struggling with a toothache, you’re not alone! Help and relief are available, and just a phone call away. Why Do I Have Tooth Pain & How Can it Be Fixed? Keeping up with your regular hygiene cleaning appointments will help to monitor your dental health and concerns. Our team of highly skilled, highly trained dental professionals knows precisely what to look for in your smile that could be a potential sign that it could lead to something more significant down the line. It’s important to take care of your teeth with regular dental checkups and consistent at-home care. When a tooth or multiple teeth are lost, it is usually a cause for concern and should be addressed as soon as possible. It can also be very concerning as nerve endings are triggered and the remaining nearby teeth are subject to possible decay and deterioration. You might feel embarrassed that you’re missing a tooth or multiple teeth, but it is actually a common problem among patients like you in our dental office in Asheville. One possible, secure solution is a dental implant. It will not only get you out of pain, but it can also restore your smile and your bite for improved function and aesthetics. You were enjoying a nice bowl of popcorn with your usual Friday movie night with friends when all of the sudden you bite down on a hard kernel and the next thing you know you’re staring at a broken tooth in pain. Sometimes we have no idea our teeth are even cracked or damaged before they break apart which is why it’s important to have regularly scheduled visits to your Asheville dentist. But if something does happen and you find yourself in pain, call us so we can take a look. Sometimes a broken tooth or teeth can benefit from a safe, durable crown or bridge to help fix broken or missing teeth. Crowns and bridges are common restorations that are proven to restore your smile health. So, isn’t it easy to see why so many patients like you come to our state-of-the-art Asheville dental office nervous about their dental fears? While there are so many things that can go wrong with your teeth, we want you to feel comfortable knowing that you’ve made the right decision to let us help you. We never want any patient of any age to feel discomfort and struggle with painful dental issues. Our team takes great pride in helping restore your oral health and give you the complete smile you deserve. Please call Phillips & Schmitt DDS today, at 828-254-1944, so we can help you feel better too!